Galadriel is one of the great and beloved rulers of Lothlorien. She is wise, powerful, beautiful, and kind. This painting depicts the moment when Aragorn is given the Elfstone of the house of Elendil, a gift that is a great honor and a symbol of hope for the warrior and heir of Isildur. As any true Tolkien fan knows, Galadriel was the most significant women in Lord of the Rings. Yet, her appearances were limited by comparison to that of the leading cast. 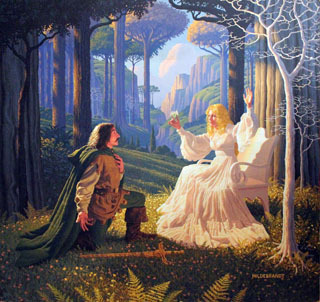 Because of this, Galadriel only appeared in 3 of the Brothers Hildebrandt’s 1970’s paintings.